June 22 - Saint Paulinus of Nola, Bishop - Optional Memorial - My Catholic Life! Saint Paulinus was to the manor born. And it was a very nice manor. He was of the Roman elite, raised on an aristocratic estate near Bordeaux, France. His family included senators and other high officials of empire. Paulinus received a superior education from a well-known tutor and served, while still in his twenties, as Consul of Rome and Governor of Campania, in southern Italy. He was humble, sage, gentle, well read, and intellectually curious. Paulinus represented, in short, the very best of Rome. He would, in time, represent the very best of the Church. 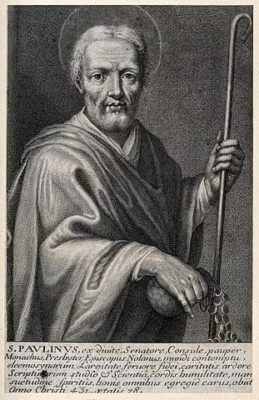 While serving as Governor of Campania, Paulinus witnessed the simple but sincere piety of the common people who went on pilgrimage to the shrine of Saint Felix of Nola, who had suffered for the faith around 250 A.D. The people’s faith moved Paulinus to his core and planted a seed in his soul. Paulinus suffered personal setbacks due to the political machinations inherent to empires, which awakened him to the fleeting nature of power and prestige. He moved to Milan and studied in the school of Saint Ambrose. When Paulinus returned to Bordeaux, he was baptized by the Bishop. The seed of faith planted in Campania had germinated in Milan and been harvested in Bordeaux. It would bear fruit for decades to come. Paulinus, though married, was ordained a priest around 394 and then returned to the land that had first nourished his faith—Nola, in Compania. He would never leave it. After his wife’s death about 410, Paulinus received episcopal ordination and served as Bishop of Nola until his death. In this he was in a wider tradition of educated Roman men of the fourth and fifth century who served the Church as Bishops rather than the empire as governors. As Bishop, Paulinus’ greatness revealed itself. Although he never wrote theological treatises or scholarly works like Saint Jerome, he maintained a sustained correspondence with this great man and many others, including Saint Martin of Tours. Paulinus wrote to a North African bishop whose close friend had just had a powerful conversion. Paulinus was curious and asked the bishop for more information. The friend’s name was Augustine and his response to Paulinus was the “Confessions.” History has Paulinus of Nola to thank for this seminal work from the great Augustine of Hippo. Paulinus and Augustine became close friends, although they probably never physically met. Saint Augustine even wrote: “Got to Campania…there study Paulinus, that choice servant of God.” If one is known by his friends, Paulinus’ many friends speak to his sterling character and reputation. Saint Paulinus was a master of the art of friendship, particularly spiritual friendship. He understood the Church, the Body of Christ, as a forum where true friendship flourishes. He wrote to Saint Augustine: “It is not surprising if, despite being far apart, we are present to each other and, without being acquainted, know each other, because we are members of one body, we have one head, we are steeped in one grace, we live on one loaf, we walk on one road and we dwell in the same house.” Beautiful! The Church is a communion of souls, a theological and sacramental family where deeper relationships take root and flower. Saint Paulinus is still venerated in Nola and its environs, where on his Feast Day the faithful carry in procession enormous lily-adorned towers in which stand large statues of Saint Paulinus. Saint Paulinus of Nola, may your humility, education, and serenity be an example to all who are searching for God. May they imitate you in finding Him, loving Him, and in dedicating your life to Him amidst a large circle of like minded friends. PAULINUS was of a family which boasted of a long line of senators, prefects, and consuls. He was educated with great care, and his genius and eloquence, in prose and verse, were the admiration of St. Jerome and St. Augustine. He had more than doubled his wealth by marriage, and was one of the foremost men of his time. Though he was the chosen friend of Saints, and had a great devotion to St. Felix of Nola, he was still only a catechumen, trying to serve two masters. But God drew him to Himself along the way of sorrows and trials. He received baptism, withdrew into Spain to be alone, and then, in consort with his holy wife, sold all their vast estates in various parts of the empire, distributing their proceeds so prudently that St. Jerome says East and West were filled with his alms. He was then ordained priest, and retired to Nola in Campania. There he rebuilt the Church of St. Felix with great magnificence, and served it night and day, living a life of extreme abstinence and toil. In 409 he was chosen bishop, and for more than thirty years so ruled as to be conspicuous in an age blessed with many great and wise bishops. St. Gregory the Great tells us that when the Vandals of Africa had made a descent on Campania, Paulinus spent all he had in relieving the distress of his people and redeeming them from slavery. At last there came a poor widow; her only son had been carried off by the son-in-law of the Vandal king. “Such as I have I give thee,” said the Saint to her; “we will go to Africa, and I will give myself for your son.” Having overborne her resistance, they went, and Paulinus was accepted in place of the widow’s son, and employed as gardener. After a time the king found out, by divine interposition, that his son-in-law’s slave was the great Bishop of Nola. He at once set him free, granting him also the freedom of all the townsmen of Nola who were in slavery. One who knew him well says he was meek as Moses, priestlike as Aaron, innocent as Samuel, tender as David, wise as Solomon, apostolic as Peter, loving as John, cautious as Thomas, keen-sighted as Stephen, fervent as Apollos. He died in 431.